Nothing is worse than sand all over your beach chair. It eventually gets all over your car and other items. 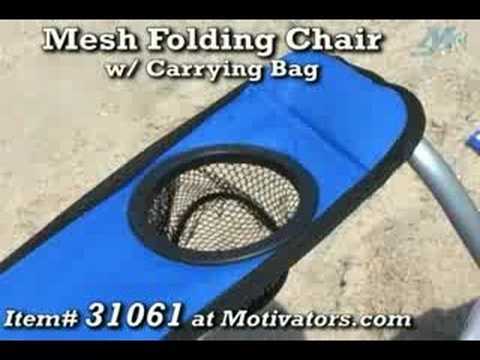 Luckily, the custom imprinted Mesh Folding Chair with Carrying Bag has a mesh bottom and back to allow sand to seep through. The two mesh cup holders allow you to hold your favorite cool beverages and the weight limit of 300 lbs. means it's rather durable. Steel Tubular Frame - Weight Limit 300 lbs. Run Charge: $1.00 for each additional location per item. Customer Review: We very much like the chairs, as well as our employees. They turned out great! Question: What is the folded up size inside the carry bag? How much does it weigh? The size is 34 ½ x 5” The weight is 6 pounds per piece. Please feel free to contact me with anything further. Have a good day.